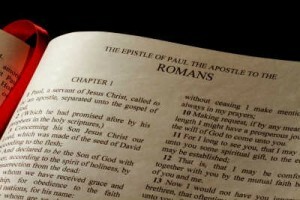 Romans chapter 12 is a turning point in the book of Romans. In the previous chapters the main emphasis in the book was why we need a Savior and how we can accept Him. However, this chapter begins to deal with how a Christian ought to live out his salvation. There are many practical points to daily Christian living which begin in Romans 12 and continue to the end of the book. As you study through the book of Romans, and particularly chapter 12 and following, it is important to note that salvation is through God’s grace and not our works. However, a natural result of this salvation is to live a life pleasing to God. This is exactly where Paul picks up in Romans 12:1. Paul says that because of the information that has been presented up to this point, he proposes that it is reasonable that one would be completely sold out to God as a sacrifice to be used in whatever manner God chooses. It is natural to want to thank God for your salvation by turning your life over to Him. There are many practical points to daily Christian living which begin in Romans 12 and continue to the end of the book. Don’t allow the world to shape you. Allow God’s Holy Spirit to control. Submit your thoughts to Him and the practical outworking of that will be to follow God’s plan that He has already designed for you. Of course, there is no obligation to obey God, otherwise our salvation would still be based on works. However, in light of Romans chapters 1-11, it is reasonable (verse 1) to want to know this plan of God for your life. Thankfully, we are not left wondering what God’s plan is. Paul begins to lay out some very practical ways we can obey God’s plan in the following verses. Paul begins a treatise on how a mature Christian should live. Again, we are not obligated to live this way because our salvation does not depend on it. Yet, because of gratefulness we should want to live a Christ-like life. Understand who you are. You are not the one who saved you, Christ is. Each one of us have been placed by Christ into His body of believers. We work together to form a good functioning body. This is done as a whole unit of Christians in the body of Christ, but also in smaller units we call the local church. A church functions properly when its members, with different spiritual gifts, exercise those gifts in a way that honors Christ. But it starts with an attitude of humility. The illustration which Paul uses is a physical body. This is further expanded upon in 1 Corinthians 12. Not all body parts accomplish the same purpose; or, as he says here not all have the same office. Not everyone can be the pastor of a church. There needs to be other teachers and people who care for the music and children and widows. Some people may have the responsibility of cleaning bathrooms in a church. While it may not seem glamorous, I can promise that if that job is not done, then at some point the pastor will not be able to effectively teach. Each person doing their part makes a church function. The same is true with the spiritual gifts. Everyone in the church needs to serve using the gift(s) they have been given by the Holy Spirit. The first part of the book is the why and how of salvation. Starting in Romans 12 and continuing through the rest of the book you read about the why and how of the Christian’s life on earth. We call that sanctification. If you are seeking to do God’s will on a practical level today then choose one of the teachings in Romans 12 and put it into use before the day is done. Great article David. Romans 12 has always held a special place in my heart. As you mentioned, it tells us that we should surrender our lives to His will. It has been my experience that this is the best way to live, by far. I love your expository style writing, very powerful. God bless you. Thanks for sharing this info on Romans 12. The power of the book of Romans, especially when looked at as a journey from sin to salvation is incredibly powerful. The manner in which Paul, led by the Holy Spirit, lays out the pathway to salvation is simply awe inspiring. I particularly like vs. 2 above for the true power of God is in the transformation of our life to be made in the image of Christ. Thanks for the article & God bless. I really liked this article…its a good practical guide for how we should be living. Excellent article, David. Romans 12 is very powerful in its description of a Christian’s walk. Romans 12 10-13 (“Be kindly affectioned one to another with brotherly love…Distributing to the necessity of the saints.”) has been so powerful in my wife’s and my life that we are in the process of developing an online Christian charity focusing on Christians directly helping their fellow Christians in need in an interactive way. The full site is still in development, but moving forward for the glory of God. Please keep our mission in your prayers as we will keep yours in ours. together as one body but different members of the body of Christ to know what gifs GOD has BLESSED with. Romans 12 is a pillar for change, it is that chapter that will give you the tools to live according to God’s plan. it is important as you need to transform your mind, renew it, think differently and knowing that the past is gone and the future is as per God’s plan if only you allow the holy spirit to lead. Working together as a team, using the God given talents or gits in unison. You are so right my friend. It is so powerful. Confused. I understand this article re: sacrifice. What I don’t understand is the concept about suffering, In particular, I read this in a book (Theresa of Calcutta). In it it states, “My people in Kalighat are living martyrs & not yet not a word – A young boy who suffered horrible pain – at last he said – he was sorry to die – because he had just learned to suffer for the love of God.” Actually not sure why Theresa aid her people are living martyrs because they aren’t (or if so, it is not said) suffering for their faith. I understand that people have suffered for standing up to their faith. I understand that people who handle suffering with faith can be an inspiration to others. I don’t understand what the quote means. Maybe I just don’t get it. Thank you Maureen. The word Greek word for “witness” is actually “martyr” so to be a living witness (martyr) is technically correct. Maybe that is what they meant. Jesus did say “whoever seeks to save his life will lose it and whoever seeks to lose his life will save it” so it may be these, but I really don’t know for sure. As a Christian, Is it a sin to celebrate their birthday? Hello Brenda. I see nothing in the Bible that restricts or forbids celebrating someone’s birthday. Some churches believe it is, but there is no biblical basis or proff for their beliefs. I think it’s fine. How about Christmas en New year placing christmas tree in the church. Is this appropriate? I see nothing wrong with that at all. This season is very special. I have never seen any biblical reason not to do this. Even though there is no Biblical reason there should NOT be a Christmas tree in a church. Ones focus when entering and being in church becomes more on the tree and its’ decorations and not why they are there. Thank you Charles. The Christmas tree in a church is no issue at all as people don’t focus on the tree over Christ. Jesus is not a tree but the church is not a decoration nor is Jesus so your comment is a bit confusing. Next post: Should Creationism Be Taught in Public Schools? Is it Legal to do so?